The Hohrein Group & Lake Forest North Team Up! 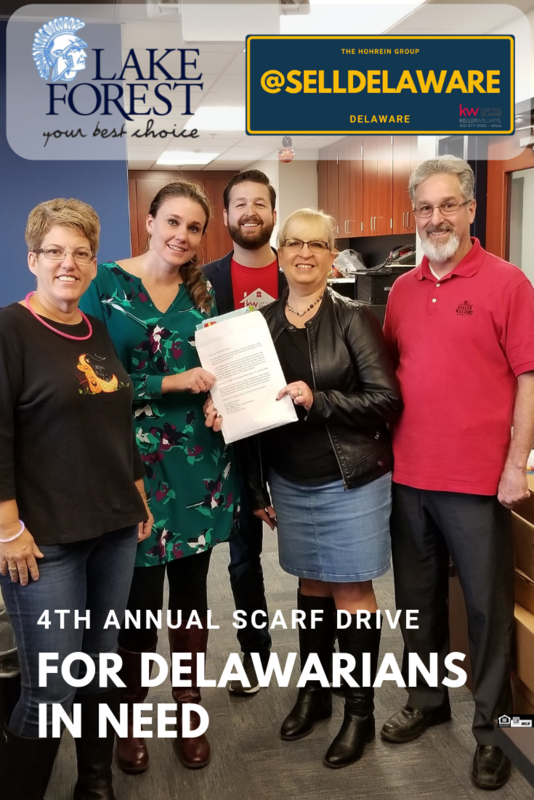 The Hohrein Group from Keller Williams Realty Central Delaware is teaming up with the students of Lake Forest North Elementary School to collect scarfs to be distributed to the needy at the end of November 2018. “This will be the fourth year we have collected and given scarfs out and the demand is growing, so we are teaming up with Lake Forest to leverage our efforts,” said Sandy Hohrein. Sandy ran the idea past Mrs. Schlitt, a personal friend and client of The Hohrein Group which turned into a contest for the students. The class that collects the most scarfs will be rewarded with a pizza party that is hosted by The Hohrein Group. Ron Hohrein said, “This is a great way to teach our children by our example to give back to the community and show compassion to someone else less fortunate.” Pictured left to right, Mrs. Schlitt (teacher), Mrs. Dotson (Principle,) Brandon, Sandy & Ron Hohrein from The Hohrein Group.